The Aquascape Dual Union Check Valve 2.0 provides a professional pump and plumbing connection inside skimmer filter systems, as well as pondless water vaults. Aquascape Water Fill Valves automatically add water to the feature when needed. Reduces time consuming maintenance manually filling with a hose. Helps protects pump from running dry. Better for the ponds ecosystem by adding small amounts of water as needed, eliminating large water chemistry swings that occur during top-offs, including chlorine/chloramine levels. Adds water to ponds, large fountains, and pools as needed. Mechanical arm style water fill valve allows up to 3 gallons per minute flow rate at 0-100 PSI. Includes fittings to connect 1/2-inch poly pipe or 1/2-inch PVC pipe. 2.5-inch diameter valve allows up to 1.5 gallons per minute flow rate at working pressure of 8-65 PSI. Ideal for Aquascape Signature Series Skimmers and Pondless Waterfall Vault. Mounting plate allows 4-inch setting adjustments. Includes quick-connect fitting for 1/4-inch poly pipe water line. Can also be used with 1/2-inch poly or PVC pipe by using with Aquascape Fill Valve Irrigation Conversion Kit (#01008). Aquascape screw type restricting clamp, used to restrict the flow of water through your tubing. The convenient and removable multi-hose coupling allows for components to be easily removed and stored during winter months or when not needed. Multi-couple fittings allow you to use 1", 1.25" or 1.5" pipe. Conversion kit for Hudson Water Fill Valve (29469). 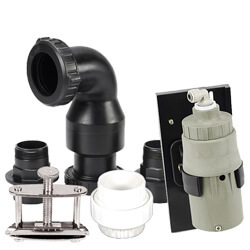 Converts 1/4" Hudson Water Fill Valve connectivity to 1/2" poly or PVC irrigation.